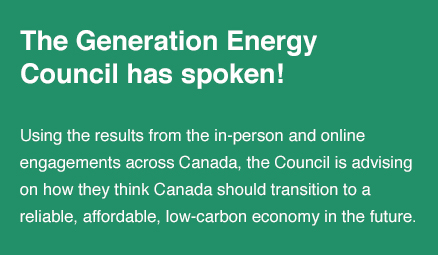 The Generation Energy Council has spoken! Using the results from the in-person and online engagements across Canada, the Council is advising on how it thinks Canada should transition to a reliable, affordable, low-carbon economy in the future. 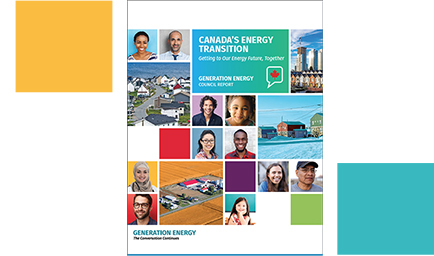 Beginning on April 21, 2017, over 380,000 people joined a national dialogue on Canada’s energy future. Why? To find out how Canadians want to meet Canada’s climate goals, create jobs and keep energy affordable. You told us that the transition to a Canadian low-carbon economy and society is underway. Luckily, our energy resources and technologies provide a strong platform for long-term growth and prosperity. Canadians told us they want to play an active role in creating this future. They foresee bold leadership and action from all facets of society. You told us it is important to plan Canada’s low-carbon energy future through meaningful dialogue that includes everyone’s voice. You told us about the importance of supporting transparency in energy decisions and growing a competitive low-carbon future through entrepreneurship, science and innovation. You told us that we need to make smart energy investments to promote economic and environmental outcomes. We’ve heard your ideas. Now we’re turning them into actions. There should be more rebates toward fuel-efficient vehicles and more charging stations. Create a network of charging stations to connect Canada from coast to coast to coast! Learn how NRCan will support demonstrations of next-generation and innovative electric vehicle charging infrastructure that address barriers to deployment. Get more information on incentives to support the deployment of electric vehicle chargers as well as natural gas and hydrogen refuelling stations. Canada has an opportunity to lead in the development of the supply chains for those [smart grid] technologies and in their adoption, and thereby to create new employment opportunities in export industries which will survive the sunset of the fossil fuel era. Find out how NRCan plans to support the deployment of proven smart grid integrated systems to reduce GHG emissions and demonstrations of promising near-commercial smart grid technologies. There are over 292 communities in Canada that depend on the supply of diesel fuel to support their total energy needs. These practices are both unsustainable and prohibitively expensive. We’re committed to employ renewable energy technology to reduce reliance on diesel in Canada’s rural and remote communities. Development and delivery of knowledge and skill to enable reducing diesel dependency in Canadian rural and remote communities. Call for proposals coming soon. Increase cross-Canada energy efficiency standards in buildings and in particular on all new construction projects. Create incentives for building retrofits and create a nation-wide policy on net-zero buildings. Learn how NRCan will support projects to develop and implement new building codes to retrofit existing buildings and build new net-zero energy consumption across Canada. Because of a changing climate and new tech, the way we make, move, and use energy needs to change. So six months ago, we asked Canadians a big question. What does Canada’s energy future look like to you? To make a long story short, you responded. On our website you learned about our current energy system, submitted ideas/comments/ratings, and completed polls. You met with us in person in forums and workshops. You also talked with us on social media, and in polls through a mobile app. We heard from you all across the country. And responded you did! So thank you, for helping to shape Canada's energy future. You told us that the transition to a Canadian low-carbon economy and society is underway. Luckily, our energy resources and technologies provide a strong platform for long-term growth and prosperity. Canadians want to play an active role in creating this future. They foresee bold leadership and action from all facets of society. Although the pace of the transition is still in question, Canadians recognize that Canada has an opportunity to play a leading role in the global low-carbon movement. Try one of the links below to see what Canadians told us about their energy future.